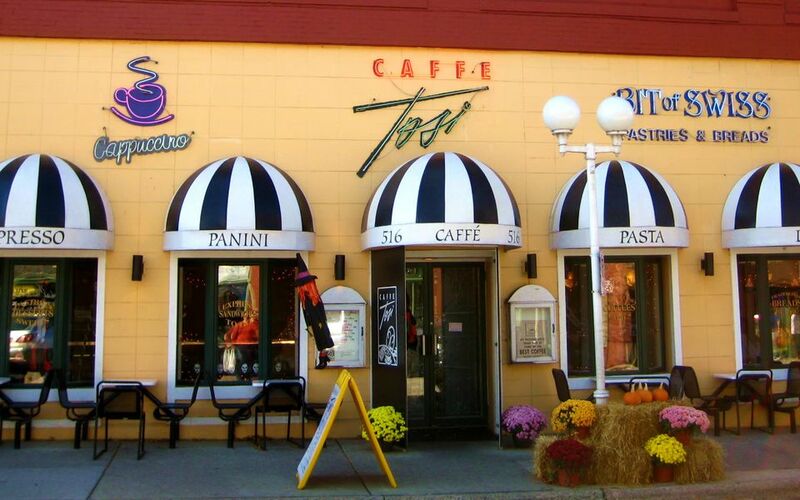 Caffe Tosi downtown is the perfect spot to start your day in St. Joseph. They offer every kind of tea, coffee, and coffee drink you can imagine, plus there are great muffins and pastries (the Almond Horn is amazing), fresh yogurt, fruit, granola, and egg sandwiches. Located in Southwest Michigan, St. Joseph claims one of the best stretches of coastline along Lake Michigan, with blocks of deep beachfront. In the summer, it’s a haven for families and friends escaping the heat of the city, but it still retains its beauty for the rest of the year. Don’t leave St. Joseph without taking a walk along this beautiful beach. St. Joseph is a perfect beach getaway for the summer, but shopping is something that can be enjoyed year-round. Downtown you’ll find quite a few specialty stores, including everything from chocolate shops to antique stores, whether you are looking for some local treats as souvenirs or just want to pick up a couple of knickknacks. Friends by Design, DK Boutique, and Perennial Accents are three of the most popular boutiques in this Michigan town. They operate under friendly competition, consulting with each other to make sure each has its own unique clothing items and accessories, from both local and international designers. Here you can pay a monthly fee or buy session packages to use all of the spa equipment on your own. Included in that selection ​is a massage chair, an Infrared Sauna, a Lumiere Facial Machine, and a Hydration station which looks like a tanning bed, but improves your skin. FuzzyButz is the ultimate pet store as it also doubles as a pet bakery, with the kitchen in the back, for your four-legged friends. You may find the smell of fresh baked goods luring you too, especially with shapes like that of hamburgers, French fries, waffles, and cannoli. You’ll also find what may look like standard pet treats here, but they are flavored with such things as cherry apple spice, sweet potato, chicken, and peanut butter, which is in most of the homemade product since it’s good at sticking the ingredients together. The Silver Beach Carousel is indoors by the beach in St. Joseph and open all year round. It’s a must-see, but you really should buy some tokens and take it for a spin. The hand-carved horses and brass ring machine date back to 1910. The Silver Beach Carousel Society was formed in 1997 to make sure its beauty is restored and maintained. The major restoration was done in 2010 and additional improvements continue to be made. The Buck Burgers & Brew is a staple in downtown St. Joseph for its food and beer. One of the things they are known for are the juicy burgers. You can pretty much concoct a couple hundred different burgers using their selection of patties, cheese, and toppings, but they seemed to have gotten it all right with one of their own creations: a Brie Cranberry Turkey Burger. Make sure you order it with sweet potato fries for the full Thanksgiving effect. Southwest Michigan is a hotbed of wineries and two of those have tasting rooms right in downtown St. Joseph. At White Pine Winery, you’ll find classic, award-winning wines that fit right in at your dinner table, such as the Traminette and the Pinot Grigio. Baroda Founders Wine Cellar has a bit more fun with the winemaking. They’ve bottled a red called Smoreleaux, which is infused with marshmallows and chocolate.